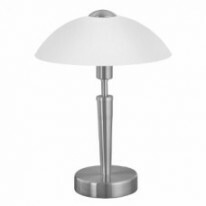 Anemone Touch Lamp ClearFeatures:Accommodates: 1 x..
Anemone Touch Lamp SmokeFeatures:Accommodates: 1 x.. There is a lot to say about touch lamps, the best thing is how more convenient they are than other lamps. Touch lamps basic feature is to turn on and off by just a press, some of the lamps we stock have different brightness with each touch, so you can press 3 times to enable dim, bright and the brightest option. Another item to add to the convenient list is no more hunting for switches in the the dark as you can touch any part of the lamp... of course, not the bulb. The touch lamps we stock are very cost efficient and built with the best martial by the biggest manufacturers around.